John Wilkes Booth was born in Bel Air, Maryland, the son of Junius Brutus Booth, an actor, and Mary Ann Holmes. He was a spoiled child whose education was limited because of his failure to attend school regularly. His father was often on the road, appearing in plays in other parts of the country, and he died when Booth was only fourteen years old. Booth was very handsome and charming, and he decided while still in his teens to become an actor like his father and his brother Edwin. Although he sometimes refused to learn his lines and was unwilling to work very hard at acting, he had natural talent that made him popular in performances of the plays of William Shakespeare (1564–1616), especially in Richmond, Virginia. In 1860, the year Lincoln was elected president, Booth became more popular as he played to approving audiences across the country. It seemed that he would soon be famous. 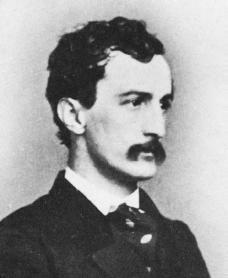 Unlike the rest of his family, John Wilkes Booth had always been a supporter of the South. He believed the Civil War was necessary to maintain Southern freedom. Booth resented the Northern position that slavery had to be outlawed. He attended the execution of John Brown (1800–1859), one of the most famous abolitionists (opponents of slavery) in history. Booth wrote that he considered abolitionists to be "traitors" and that they deserved the same fate as Brown. When a breathing problem in 1863 forced Booth to leave the stage for a while, he began to work on a plan to kidnap President Lincoln and deliver him to Richmond. He may have intended to use the president in an exchange to secure the release of some Confederate (Southern) prisoners. It is not known whether this was all Booth's idea or if he was acting on the orders of someone else. He enlisted six other Confederate supporters in the scheme. In March 1865 they planned to capture Lincoln near Washington, D.C., but the president failed to appear. Booth's anger over the mission's failure is believed to have led to his decision to assassinate Lincoln. Booth learned at noon on April 14 that Lincoln would attend a performance of a play called Our American Cousin at Ford's Theater in Washington that evening. Vice President Andrew Johnson (1808–1875) and Secretary of State William Seward (1801–1872) were also supposed to be killed, but the other members of Booth's gang failed to carry out these murders. Booth went to the theater in the afternoon and fixed the door of the president's private box so that he would be able to get in later. At about ten o'clock Booth entered the theater, shot Lincoln, and jumped to the stage, shouting "Sic semper tyrannis! (Latin for 'Thus ever to tyrants!') The South is avenged!" Lincoln died the next morning. Booth had broken a leg when he jumped to the stage after the shooting. The pain slowed him down as he tried to make his escape, and he and another suspect were forced to seek medical help. A doctor named Samuel Mudd treated Booth's leg and fed the two men. For several days they tried to cross the Potomac River, and when they finally succeeded, they traveled to the farm of Richard Garrett, south of the Rappahannock River. Pursuers found them in Garrett's barn on April 26. When Booth refused to give himself up, the barn was set on fire. His figure was seen briefly just as a shot was fired. Although one of the pursuers claimed to have shot Booth, it is unclear whether he was killed or committed suicide. Booth's pro-South friends were quickly rounded up and put on trial. Four of them were sentenced to death. Mudd and two others received life sentences. One of these men died in 1867; the other man and Mudd were both pardoned (allowed to go free and not serve the sentences for the crimes of which they had been convicted) in 1869. John Wilkes Booth, the leader of the group, will be forever remembered for his twisted vision of patriotism. He never understood the horror caused by his act, and he died with these last words: "Tell Mother … I died for my country." Otfinoski, Steven. John Wilkes Booth and the Civil War. Woodbridge, CT: Blackbirch Press, 1999. Prehaps John Wilkes Booth in his own mind thought what he did was right, Lincoln infact did start a war, instead of trying to negotiate peace meetings with Southern delegets, was it not the North who introduced slavery to the South? Abolitionist were to blame for the outrages lies told to the public about the horrors of slavery, when in fact it was not near as awful. The Confederate army had black soldiers, why would that happend if at least some of the slaves were treated like those lying abolitionist said they were being treated? I wonder if any of those poison spewing abolitionist ever visited the South and actually saw first hand what really was happening? today these people are called libreals and still causing trouble. Lincoln did infact sign papers to kidnap and or assassinate Jefferson Davis, but in the end it was Lincoln who was assassinated, although it would have had much better effect if it happend during the war, Booth would have been called a Southern patriot, but after the war it was not neccessary, but perhaps Booth thought it did. I think that Booth did have his reasons to assassinate Lincoln, but I don't agree with him. He could have done his manner in a different way than Killing the President. He wanted to represent the South, he wanted to show the North that the didn't want to have slavery to be abolished. Not only did Booth think the abolitionist were traitors. I think that the people in the South( Not all the people) but most people in the South may have thought the same as Booth. But they could have done this thing in a different manner. Booth didn't have to kill the president to stop slavery from being abolished; in the end Booth was killed. Does any one have information on a Abel H Thayer of the 6th WV Cav who was a surgen at the post mortem of John W Booth. Does anyone know if John Wilkes Booth had any living children, particularly boys that may have carried on the Booth name? I haven't don't a thorough search yet but plan to get more into this. Just trying to gather any information others might have. it is said that John Wilkes Booths older brother Edwin saved the life of Robert Todd Lincoln earlier did anyone in the Booth family ever try to warn of the assasintion attempt or even apologize for it? John's comment is totally wrong and inappropriate. Equating abolitionists with modern liberals is comparing apples and oranges. What a shame that John is blinded by his obvious hatred of whoever he thinks is a liberal. The idea that Lincoln started the war is rewriting history. It is beyond a shadow of a doubt that the South fired on Fort Sumter. As for slavery being not so awful - how would John know? How would you like to be a slave, someone's property, John? Everything I have ever read about slavery has described its horrors. Slaves were bred like animals and worked to death. John's defense of Booth is outrageous. Of course, Booth thought what he was doing was right, if not he would not have done it. But murdering someone, anyone, is never right. I read somewhere that Booth ask Lincoln for a pardon for a friend of his, does anyone have infromation on this?